Videots: A Salute to World Heroes | TWINSANITY! Hello and welcome to a new segment on Twinsanity called Videots, where we pay tribute to the video games we spent our misspent youth playing. -OK, it’s not really so much a new segment: Jason (Goldstar) did a video game salute waaaay back in the first year of this blog in 2010, back when the blog was called Astral City (Astral City? Yech! What were we thinking?! ), but recently I decided to do a game salute myself, and since there’s now more than one, these game salutes can now become a recurring segment here. Why? Why not? As with the previous Videots entry, this is not a review. We don’t do game reviews here. There are already dozens of video game reviewers on the interwebz, both for new games and for retro/classic games, and all of them review games 20 times better than we ever could, so no lengthy detailed reviews from us. We just like to look back fondly on some of our favorite titles from time to time. Today we’ll be looking at ADK’s lesser-known fighting game franchise, World Heroes. 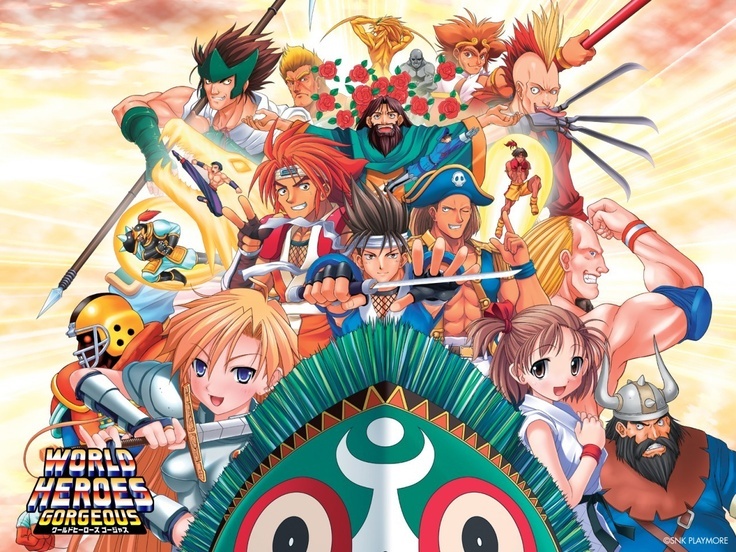 World Heroes was a series of fighting games created by ADK originally created for the Neo Geo MVS arcade cabinets with the assistance of SNK, though some of the games in the series were also ported to the Neo Geo AES and Neo-Geo CD platforms, as well as some non-SNK platforms such as the Super NES and the Sega Saturn. First launched in 1992, it was one of several Street Fighter 2 clones of its’ day. While World Heroes didn’t have the excitement factor of SF2 or the blood ‘n’ gore factor of Mortal Kombat, or even the weapons melee factor of Samurai Shodown, WH had a standout feature of its’ own: goofy humor, crazy oddball characters and wacky extreme super moves. The premise of the the WH franchise (such as it is) is that a scientist named Dr. Brown (after Christopher Lloyd’s character in the Back to the Future movies, get it? ), having perfected a time machine, organized a tournament for various fighters throughout all of history to combat each other. True to this plot, many of the fighters are based on actual historical figures, while some are fictional ones. In the first game, as was the case with many SF2 clones, there were 8 selectable characters: Hanzo, the Ryu of this game, a ninja based on the legendary ninja warrior Hanzo Hattori, Fuuma, Hanzo’s chief rival (imagine if Ryu and Ken were ninjas from rival clans and hated each others’ guts), based on based on the actual Fūma Kotarō, who allegedly killed the real Hanzo; in the ADK-verse, Fuuma stays in the present and becomes a office wage slave in a tiny cubicle–what?? as well as appearing in ADK’s Aggressors of Dark Kombat (its’ initials spell ADK–get it? GET IT??? ), Janne D’Arc, a 15th century French fencer based on Joan of Arc whose main goals are to be the strongest of all and to find a man (yay, feminism! ), Kim Dragon, the resident “I wanna be like Bruce Lee!” character, J. Carn, the personal bodyguard of Ghenghis Khan, who becomes a tyrant in his own right, Muscle Power, a 20th century professional wrestler who bears more than a passing resemblance to Hulk Hogan, receding hairline and all, Rasputin, based on the philosopher of 13th century Russia, here portrayed as a sorcerer who preaches peace and love, and as the series progresses, becomes a full-blown homosexual stereotype (check out his Desperation Move in the video at 1:35 below for proof) and Brocken, imagine if someone combined the character Brockenman from the anime Kinkiuman with The Terminator, resulting in a uniformed German officer who also happens to be a killer cyborg from a dystopian future. The boss of the game was a character named Geegus, an obviously inspired by the T-1000 cyborg that was created by a secret organization called DAMD who can shapeshift into any of the eight fighters and use their moves at will. Geegus wants to destroy the Earth (hey, you’d want to destroy stuff too if your name was Geegus), so the World Heroes tournament was created to stop Geegus’ evil plans. I told you this game was wacky. In the second installment, called–imaginatively enough–World Heroes 2, 6 more characters were added: Captain Kidd, a pirate based on the infamous William Kidd, wielder of shamanistic energy sharks and pirate ships hurled from his knuckles and possessor of one THE coolest video game stage tunes of all time, Erick, a viking based on Erik the Red, Johnny Maximum, a football pro based loosely on Joe Montana, described as a “killer machine” and a “demon quarterback” thanks to his cryptic dialogue and creepy glowing red eyes beneath his ever-present helmet, Mudman, a Pacific Islander wizard with a large wooden mask and no real historical basis apart from appearing primitive, Ryoko, a teenage Judo queen based on real-life judoka Ryoko Tamura (now Ryoko Tani) and Shura, a 25 year old Muay Thai fighter who has joined the tournament to prove his worth to his feared dead older brother (even though his brother is actually alive and well). The boss of this game is a alien being named Dio, described as “The Ultimate Thing”, while Geegus is reduced to sub-boss, but receives an upgrade to ‘Neo-Geegus’. ..Or super moves like these? Or kooky cheeseball endings like these? Idly, one has to wonder why this series has yet to receive a revival, in this age of old game franchises getting reboots and relaunches. If the old Capcom DuckTales game for the NES has gotten a new version released, why the heck has no one tried to revive World Heroes? A new WH game with those nutty moves and quotes, done in the Street Fighter 4 style? I’d play that; wouldn’t you? So here’s to you, World Heroes. You may not have gotten the attention or the accolades of other fighting games of your time, but when I was bored in my living room playing video games, you gave me a good chuckle and killed a tedious afternoon, and for that, we at Twinsanity salute you.